Sea Glass, Shell and Crystal Jewelry Workshops on Saturday, October 1st! We are incredibly lucky to have Ency Whitehill giving a Sea Glass and Shells Jewelry Workshop on Saturday, October 1, at 10 a.m. at her studio located at 54 Gilbert Street in Orono and then a Crystal Pendant Workshop on Saturday, October 1, at 1 p.m. again at her studio at 54 Gilbert Street in Orono. Jim White and Ency Whitehill retired in August of 2006. 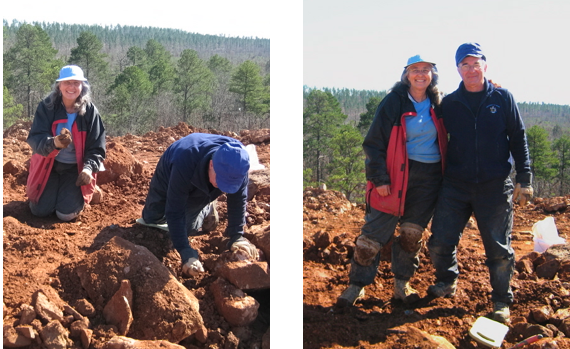 They have been avid mineral prospectors all their lives and have traveled extensively in the northeast and western United States as well as various parts of Canada exploring mines and quarries for mineral specimens. stones and to cut, slab, grind and polish minerals into cabochons and cut stones. These stones are then wire wrapped or finished in other settings. Ency has expanded her knowledge of techniques and methods through classes, books, and videos and she continues to create wire wrapped settings for stone and glass for her business, Rocks, Minerals & More. 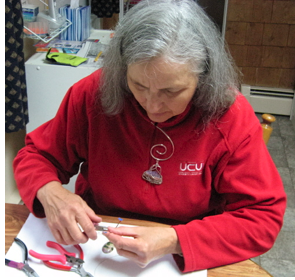 Ency enjoys teaching this art to others both privately and publicly at The Beaded Moose in Bangor. If you’d like to sign up for either of Ency’s workshops please email stillwatercommunityarts@gmail.com with your name and the workshop for which you’d like to register. 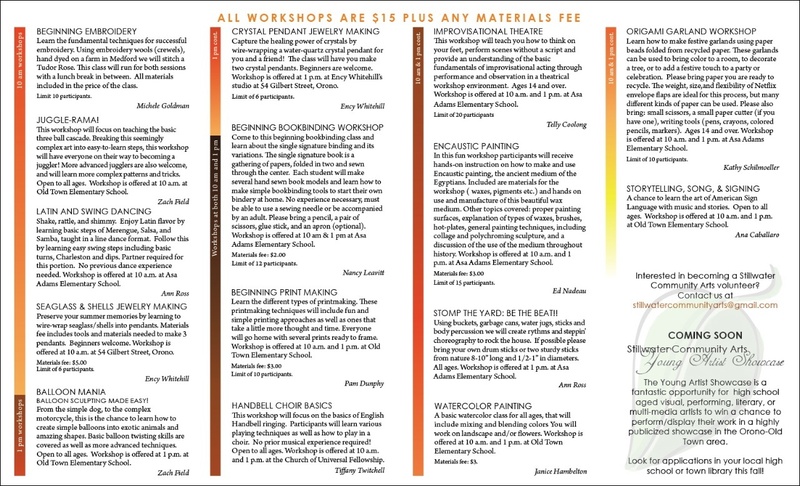 Each of Ency’s workshops are $15 plus a materials fee of $5. Please mail a check for the appropriate amount to Stillwater Community Arts, P.O. Box 292, Orono, Maine 04473. Each of these classes is limited to 6 participant so act fast, as they are almost full! One week until Fall into the ARTS workshop day! 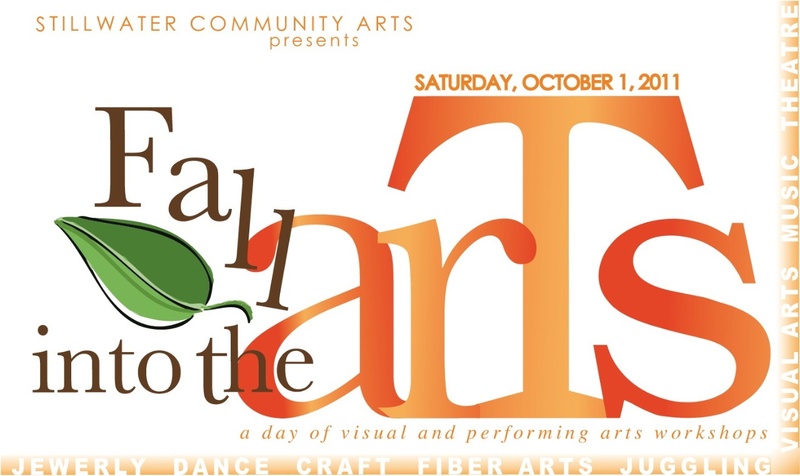 There is just one week left until Stillwater Community Arts Fall into the ARTS Workshop Day! Classes are filling up so act quickly and get your registrations into stillwatercommunityarts@gmail.com. Many people know Janice Hambelton and her renowned ability to coax beautiful painting out of even the most beginning student! We are so fortunate that Janice has agreed to teach two watercolor painting workshops at our Fall into the Arts Workshop Day on Saturday, October 1 at 10 a.m. and 1 p.m. at Old Town Elementary School! Janice is a resident of Old Town and the owner and Creative Director of Dreams by Janice, LLC, and has been painting for over 20 years! 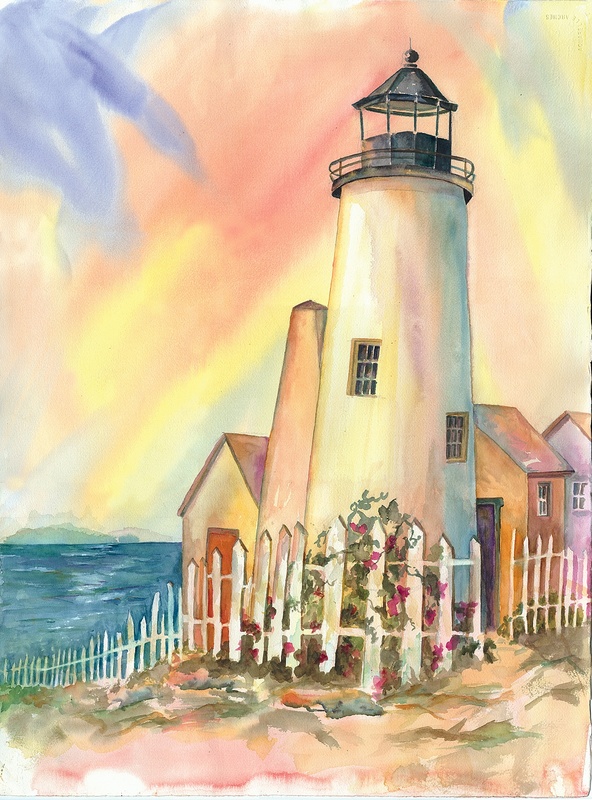 She is passionate about watercolors and enjoys painting a variety of subjects, including landscapes, still life, and portraits. She draws inspiration from her life experiences, and most recently those experiences have led her to the beautiful landscapes of Italy! Aren’t we all jealous?! Janice teaches children and adults of all ages, and her artwork is displayed around the community. To see more of Janice’s fantastic work please visit www.dreamsbyjanice.com. On Saturday, October 1st, Janice will be teaching a basic watercolor class for all ages, that will include mixing and blending colors as well as work on landscapes and/or flowers. 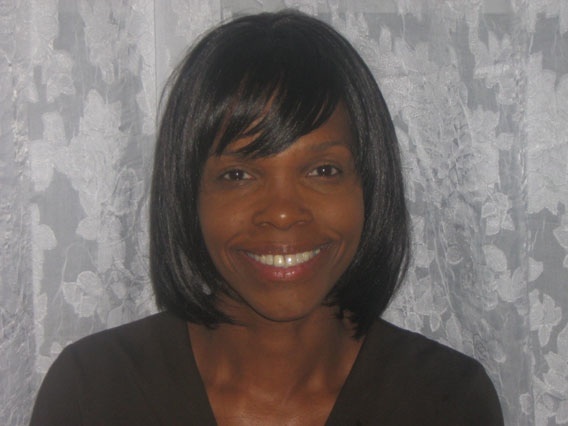 Janice’s workshops begin at 10 a.m. or 1 p.m. and are being held at Old Town Elementary School. For more information about Stillwater Community Arts Fall into the ARTS Workshop Day, please check out this brochure or email stillwatercommunityarts@gmail.com for more information. We hope to see you all immersing yourselves in the arts at one of the wonderful classes being offered on Saturday, October 1st! Art teacher extraordinaire, Pam Dunphy, will be teaching a Beginning Printmaking class on Saturday, October 1 at 10 a.m. and 1 p.m. at Old Town Elementary School. 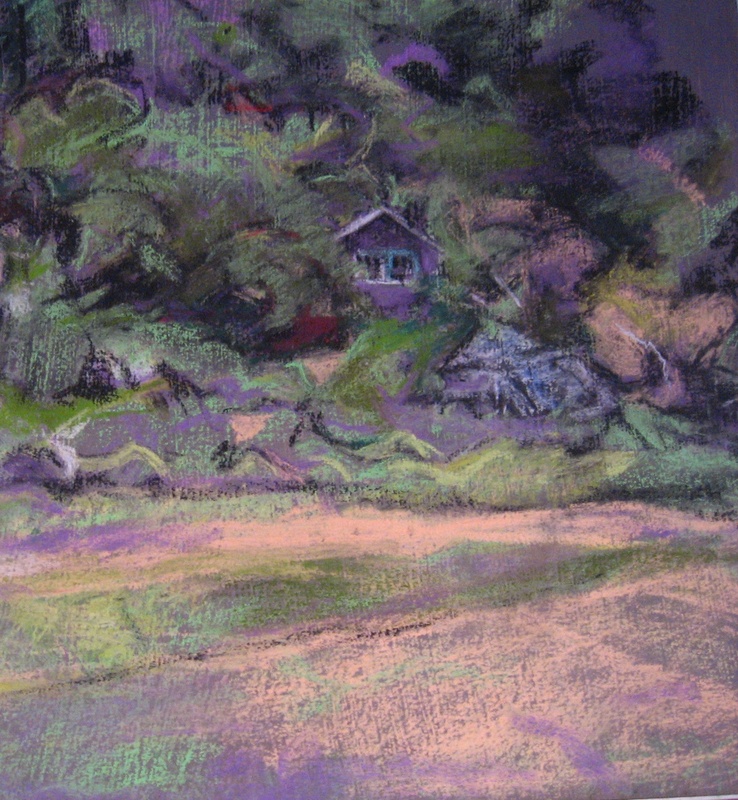 Pam moved to Old Town, Maine in 1973 and after graduating from Old Town High School she attended the University of Maine to become an art teacher. Since then she has been teaching art at Old Town Elementary School for the past twenty five years! Pam has won numerous art awards. Her art style is known as Expressive Realism and she creates this by copying her subjects until they “dance” within the composition. Pam is always learning and this is one reason art is such an exciting career for her. Pam’s workshop will help participants learn the different types of printmaking. Her printmaking techniques will include fun and simple printing approaches. Everyone in the class will go home with several prints read to frame! Sign up for Pam’s workshop today by emailing stillwatercommunityarts@gmail.com! On Saturday, October 1 at 10 a.m. and 1 p.m. Telly Coolong will be offering his Improvisational Theatre class at Asa Adams Elementary School. Telly Coolong has performed for over four years with various local theatres, performing in productions of Lillian Groag’s “The White Rose”, Neil Simon’s “Plaza Suite”, Peter Shaffer’s “White Lies”, William Inge’s “Bus Stop”, Karel Capek’s “R.U.R. 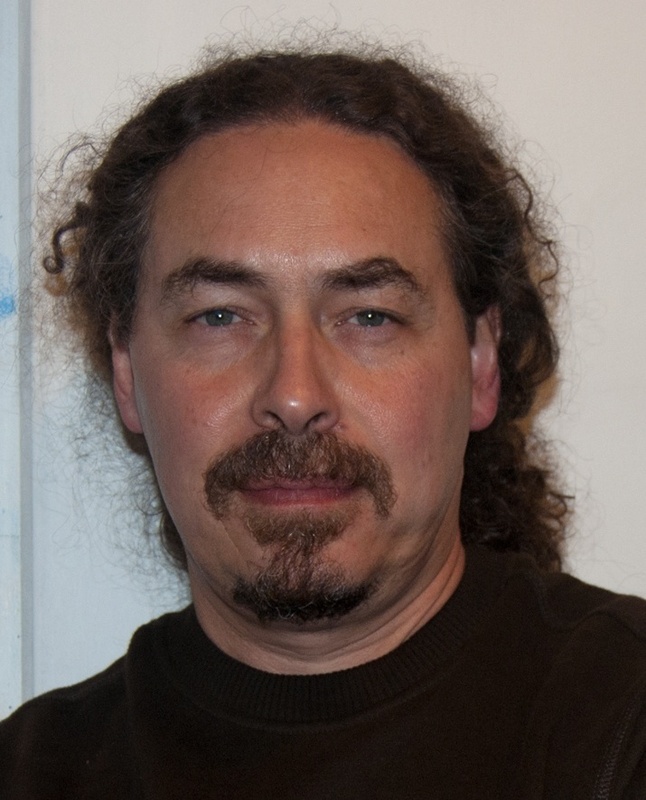 : Rossum’s Universal Robots” and Agatha Christie’s “Murder on the Nile”, as well as in Turkish playwright Özen Yula’s world premiere of “Ambling Riders” at the University of Maine. 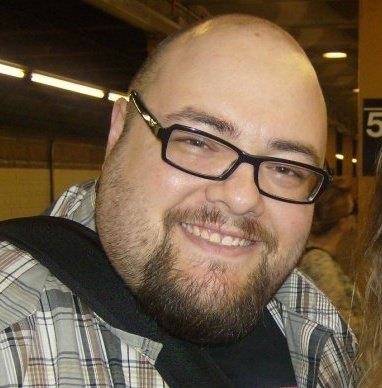 Telly has also directed productions of Neil Simon’s “Plaza Suite” for Orono Community Theatre in the fall of 2008 and Simon’s “Barefoot in the Park” in the spring of 2000 for the University of Maine’s School of Performing Arts. Telly graduated from the University of Maine in 2001 with a B.A. in theatre. Telly is also a founding member of the up-and-coming Footlight Fools acting troupe, which has performed at Brewer’s Next Generation Theatre. Telly’s workshop will teach actors to think on their feet, perform scenes without a script, and provide an understanding of the basic fundamentals of improvisational acting through performance and observation in a theatrical workshop environment. If you’re interested in signing up for Pam or Telly’s workshop please send an email to stillwatercommunityarts@gmail.com! 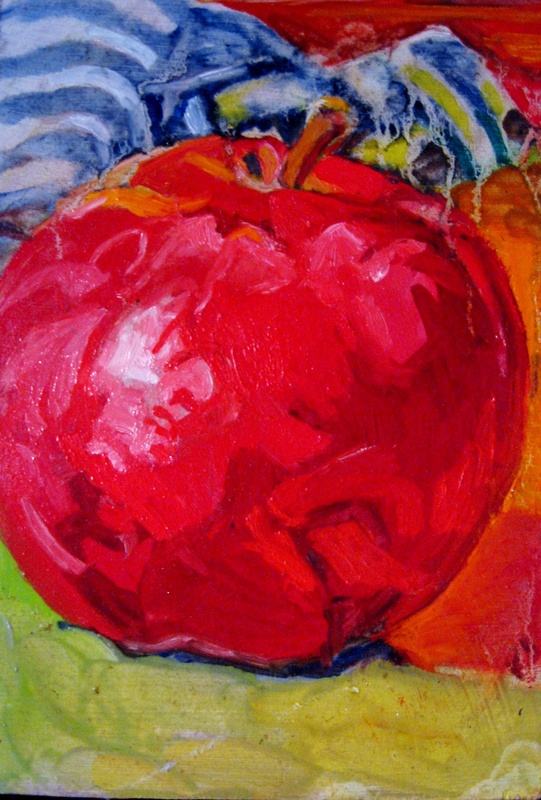 Sign up for the Encaustic Painting Workshop on October 1st! The Encaustic Painting Workshop will be a fun chance for participants to receive hands-on instruction on how to make and use Encaustic painting, the ancient medium of the Egyptians. Encaustic painting is a permanent, lovely medium which has seen a resurgence in the last 60 years. The workshop will include materials for that days such as waxes, pigments etc. and hands-on use and manufacturing of this beautiful wax medium. Stillwater Community Arts is incredibly lucky to have the amazingly talented Ed Nadeau as the Encaustic Painting Workshop instructor for Stillwater Community Arts’ Fall Workshop Day! Ed is a native Maine artist whose paintings depict the land and people of his home state in various incarnations. He graduated from Syracuse University in 1980 with his BFA in painting and from the Maryland Institute College of Art in 1986 with his MFA in painting. When Ed is not creating his gorgeous, interesting works of art, he is busy teaching 2d-design, painting, and drawing at the University of Maine. Ed’s paintings have been exhibited wi dely, including the Baltimore Museum of Art, Maryland Art Place, School 33 Art Center, the Park School, the Center for Maine Contemporary Art, Whitney Art Works, and the Drawing Center in NYC. 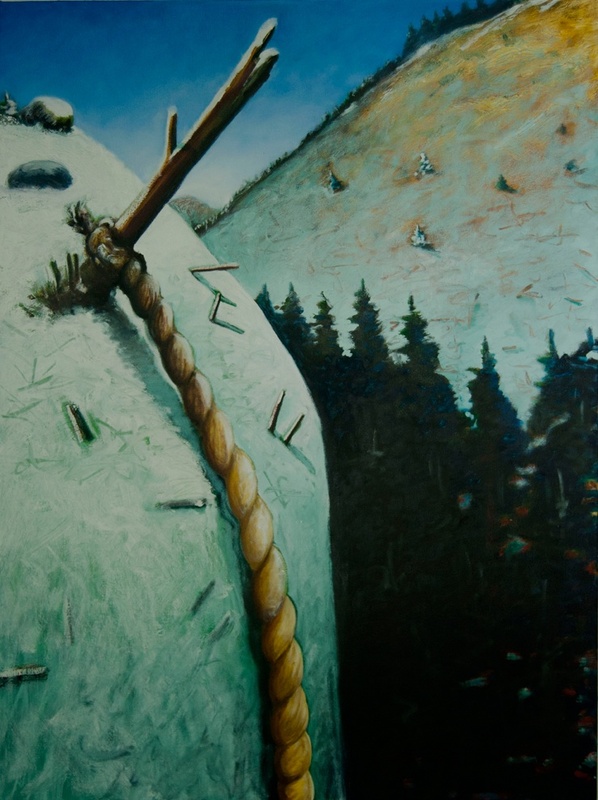 Currently Courthouse Gallery Fine Art in Ellsworth, Maine represents his paintings. The Encaustic Painting Workshop is being offered on Saturday, October 1, at 10 a.m. and 1 p.m. at Asa Adams Elementary School. This workshop costs $15 plus a $3 materials fee. If you’re interested in signing up for this workshop, please email Stillwatercommunityarts@gmail.com with your name and the workshop time you’d like. If you’re interested in some of our other workshops please download our brochure and peruse the options.